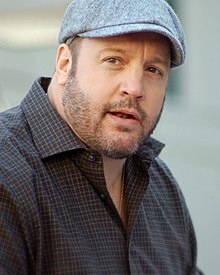 Kevin George Knipfing (born April 26, 1965), better known as Kevin James, is a comedian and actor. He is best known for his role on the U.S. sitcom, King of Queens. I'm not a gay man, but I will say this: I get it now. I know what all the hype is about. The Stars of Hitch: Kevin James. How big are muffins going to get before we all join hands across America? Have you seen them? They're huge. You walk in, "Yeah, I'll take a coffee and... Oh my God! Yeah, I'll take the bean bag chair with raisins. Wooh! Yeah! Alright, can't believe this is fat-free! Hey, you wanna help me out to the trunk of my car? No, leave the Saran Wrap on it I'll use it to cover my pool, this is good." When you're big you don't need a reason to sweat. You don't, right? My friends cannot grab a hold of this concept. They come up to me all the time like "Jeez! What have you been doing? What are ya jumpin rope in the attic?!" "Well, I peeled an orange.. about an hour ago. Why, what's up?" This annoyed me: I was on the phone with somebody today tryin to get a phone number from that person and write it down, but they didn't have phone number rhythm and that pissed me off. You know what I'm talkin about? Phone number rhythm. Especially if there's like an area code involved, like 'two one two - bum bum buh - bum buh bum buh!' That is the rhythm I think we're all familiar with. This guy had no clue! I was like "Okay, Hank. Gimme the number." He's like "Alright. It's two one two nine - fifteen eight eleven six [mumbling incoherently] fou.. tw.. five.. eight.. seven.. two." "Did you throw in your zip code? Cause I got a lot of extra numbers over here. I have extra. I can almost start a new number! What do ya got?! Start again from the top!" They really screw you up on the last four numbers. That's where they get ya. "Five five five - six.. teen forty one" "Dude, I already wrote the six! I made the dash too close, I can't shimmy the one in there now! Forget you!"